An increasing number of businesses are embracing digital technologies as a direct result of consumer preferences shifting toward extensive digital and mobile use. What does this mean for you as a property manager? One, your advertising strategy may need rethinking. Two, the way in which you communicate with renters and prospects may need to be altered to appeal to their evolving behaviors. Chances are, you utilize at least one form of advertising that has been a part of your overall marketing strategy for years. For some, this may be print. For others, it may be an Internet Listing Service (ILS). Today’s consumer, however, prefers to interact across multiple touchpoints, including on the web, on mobile devices, on social media, and yes, even print – an offline medium, which drives online conversions. This is an important fact to consider when making advertising decisions for your community. With over 20% of overall media time spent on mobile in 2013, utilizing mobile advertising as a way to promote your rental listings can prove valuable. Mobile advertising provides placement in the fastest-growing advertising medium and allows you to showcase your community’s features with enhanced content such as videos and interactive maps, driving more leads to your community. You may be wondering what the benefits of mobile advertising are. Well, according to a recent Mobile Marketing Association survey, many marketers believe that mobile advertising increases loyalty retention, facilitates transaction, generates more leads, enhances brand equity, and improves customer service. Such benefits don’t go unnoticed in the multifamily industry – after all, generating leads and providing excellent customer service are top priorities for property management professionals. Over 80% of the next generation of renters are on social media – as an apartment community, this provides you with a great opportunity to reach residents and prospects. Social media plays an integral role in the way you communicate with renters and prospective renters, so it’s important to have a strategy in place in order to reach them. 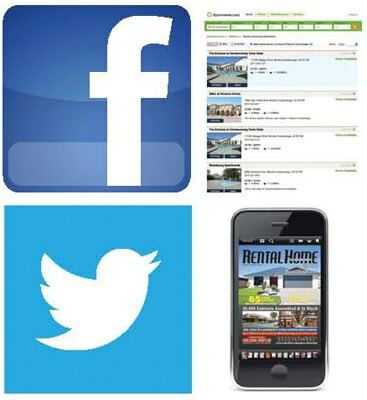 Using social media to advertise your community provides an opportunity for your listings to be distributed on the largest social networking site and the second most-used search engine in the world. Additionally, with reputation management tools, you can listen in to what residents and prospective renters are saying about your community. With over 75% of renters basing their decisions on ratings and reviews, utilizing in-ad reviews to share renters’ sentiments and reviews about your community is a powerful way to reach those looking for their next apartment. Mobile and social are just two search preferences of renters, so it’s important to consider your target audience and how they prefer to search for their next apartment. Advertising your community through a diverse media mix is an ideal way to appeal to the preferences of all prospective renters and maximize your reach. How are you incorporating digital and mobile into your marketing strategy?